Flower white, tinged light pink, pink stamens, waxy, tubular funnel-shaped, 1½" long. 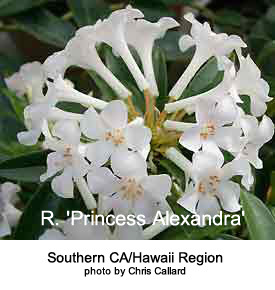 Loose truss has 7-10 flowers. Blooms several times a year. Leaves elliptic, acute apex, cuneate base, ¾" wide x 3½" long, dark green. Dwarf, compact growth habit. Hybridizer is unknown.